So You’re Ready to Launch and Want to Make a Logo in Photoshop. Just How Do You Do It? if you’re reading this article, then no doubt you have already been thinking about how to go about getting that crisp, cool tag that you can attach to your photos. This is otherwise known as watermarking your photos. There are many resources these days that you can pay into to design a very simple, yet elegant logo for your photography. However, if you are looking to tackle this on your own, this article will take you through the step by step process on how to make a logo in photoshop on your very own terms and add it to your photos. There are several reasons, but perhaps the biggest one is copyright theft of your hard work. With the ease of digital distribution, it has become increasingly important to protect your images, or at least discourage others to use your work without your permission, or worse, claim your work as their own. One thing to keep in mind here, however, is the reality that there is no way to guarantee that by watermarking your work or claiming it as your own, that it will not still be used without your consent. This article is simply to assist you to create a simple watermark on your own, and how to apply it to your photos. The first thing you want to determine is if you want your watermark to be a ‘text only’, or if you are perhaps adding, or creating a graphic to go along with it. Good news! I’m going to walk you through both. Remember to be creative, have fun, and be you in all aspects of your photography including your watermarking. 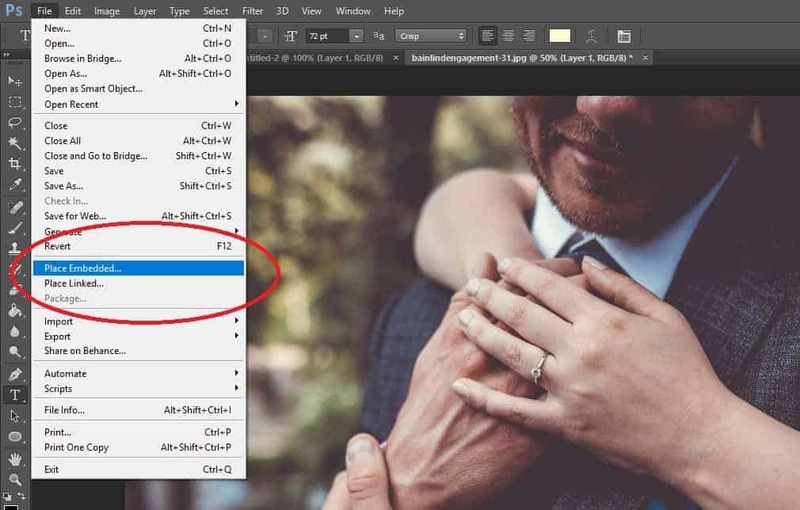 The most straightforward way to make a logo in photoshop. Sometimes even the smallest of details can distract us from the endgame, which in this case, is making sure you have a watermark to claim your work. Remember, this method just focuses on creating text, so if you aren’t one for designing a logo, this is the way to go for you. Let’s get started. Open the image that you want to watermark. Once open, create a new layer. That new layer will be your ‘Text’ layer. Select your text tool and place the cursor where you want on the photo. We recommend the bottom right or left of the image so as not to distract from your beautiful image. Before you save the image, make sure you are satisfied with how your text-only watermark looks, from font and text color. We recommend using neutral colors as they show better on images than dark, or black choices. Once you are happy, save as a JPEG. Your image will now be saved with a text-only watermark. Now you know how to make a logo in photoshop. This process is similar but slightly different. What we will make, is a logo that can be saved on it’s own, which can then be added to photo’s easily by embedding them, which we will get to shortly. If not already done so, create a new layer. Let’s stick with making this ‘logo’ text only just for this tutorial. Select your text tool and place the cursor where you want it in the box. Type in your watermark. This can be your name, business name, but make sure that it is current to how you represent yourself. Make sure that you are happy with the font, and review if you should make any corrections to the watermark. If you are satisfied, now it’s time to save. Select your logo from the folder you saved it in. Then place the logo where it isn’t overly distracting in the image. Remember you still want the focus to be the quality of your work in the image, not the watermark. Once you are happy with the placement of the ‘logo’, save the image. Your logo is now embedded in the photo. Some may be interested to know that there are many resources available that offer royalty-free imagery with photography related icons and vector art. Play around with what would fit for your photo business, and make sure that besides the photo, imagery is powerful. Make sure any image or art you select for your logo does not look out of place for your photography pursuit. As you can see, it doesn’t take much to learn how to make a logo in photoshop. I would recommend to keep it simple, but have fun and experiment with the shapes tool in photoshop, or play around with royalty free images as well. At all times, make sure that you are presenting yourself professionally, keep working at becoming a better photographer and developing a style that speaks of you, and that your clients and audience love. Now that you know how to make a logo in photoshop, let’s learn how to make some really stunning images here. Sir i need your help regarding wedding and portraits photography .So can you help me. so, we have to put/embed this logo individually on each image? or there is a way to apply this logo to all our images.